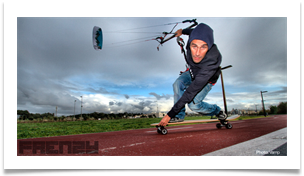 Ozone Octane Action Shots - More than Just a Trainer Kite... Loop Equiped for Landboarding and Snowkiting! Ozone Octane 4 Line Trainers for a great price. 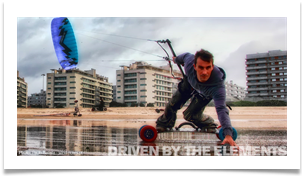 "With Loop and Safety Leash"
The Ozone Octane has smooth flying characteristics and constant pull speeds your kiting progression with no compromise. The OCTANE will keep your excitement and adrenaline pumping with its precise and always predictable handling. The Ozone Octane Available in four sizes; 2, 3, 4 and 5 meters squared, the OCTANE covers a massive range enabling action in almost any conditions. 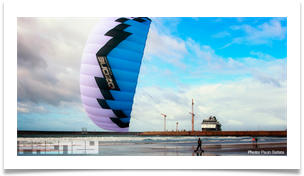 All sizes are capable of meeting the demands and capturing the imagination of any kiter. 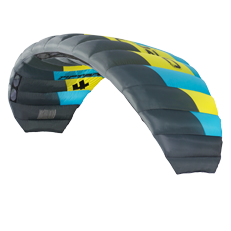 The OCTANE can be purchased as kite only or complete ready to fly, with either handles or control bar. 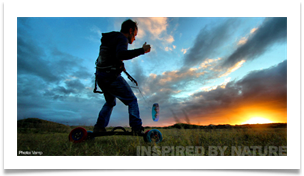 The package includes an Ozone Ground Stake, perfectly suited for securing your kite safely and easily. The 55cm Control Bar features an EVA covered 3D grip with easy to identify colours for left and right sides. 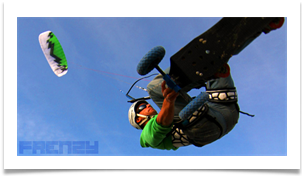 The rear brake line pulley allows for smooth kite control, combined with the safety wrist leash and release handle connected to rear lines offering an easy and effective stall system. Fly unhooked to feel the full power or hook into a harness with the benchmark Ozone Megatron Quick-Release chicken loop. Neoprene covered handles offer ultimate comfort, control and grip. The handles include power line finger chafe guards and ground stake loops on the rear leaders. Safety “Kite Killer” wrist leashes with EVA foam are also included for peace of mind when letting go. 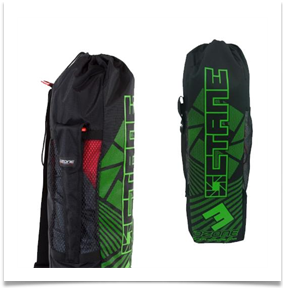 NOTE: Having a loop has seen on the zone Octane Trainer Kite will help you to cut the Kiteboarding learning curve by allowing you to get a feel for hooking and and practicing releasing your safety. 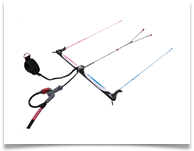 The OCTANE package includes an Ozone Ground Stake, perfectly suited for securing your kite safely and easily. The 2m is about as much fun as you can hope to have with a small kite. Massive top end wind range for high-speed buggy runs and just the right amount of challenge for anyone with ambition. 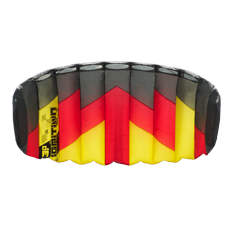 The 3m is the ideal entry point in the range for the land locked kiter, generating power early on in the wind range while always being easy to control. Quite possibly the perfect introduction to land boarding. The 4m has the bottom end power needed in the lighter winds likely to be encountered by novice snow kiters and is a great mid-range buggy engine or land board motor. 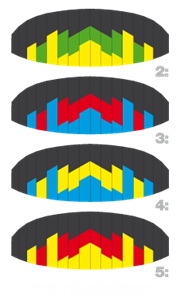 The 5m is the one to beat in is this category, with light wind performance for effortless traction and an upper limit the pros will just keep pushing.